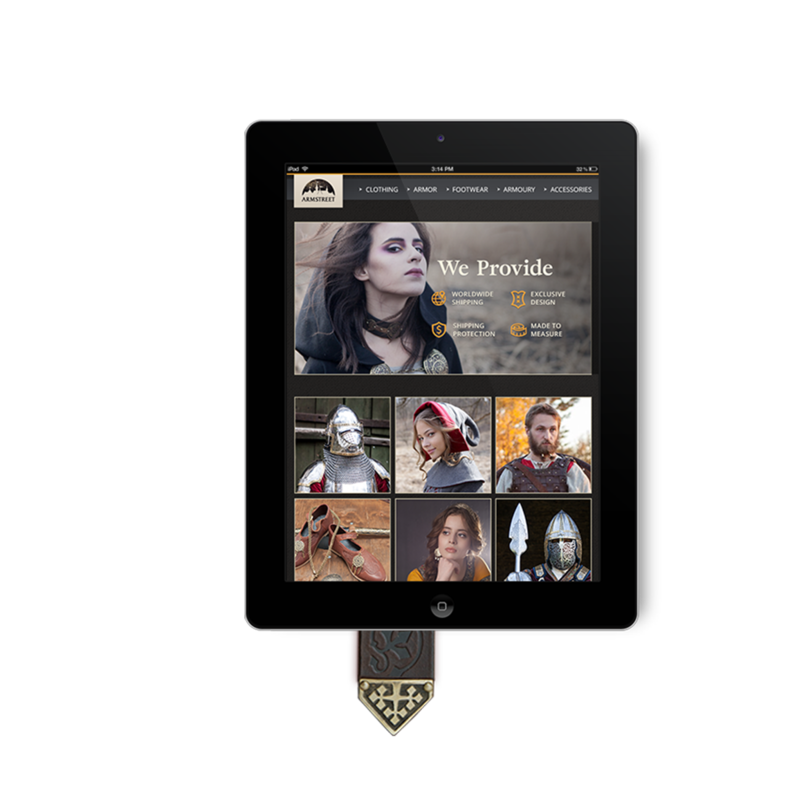 Armstreet is the unique company, where custom Medieval and Fantasy armor, clothing, costumes, armory and accessories are made. The idea was to create the unusual website as well. For this effect the last trends were combined with the medieval spirit: the flat shapes with real details, handcrafted in smithy. The website includes store, blog and user dashboard with the wide circle of opportunities. It's social orientated and designed for the special target audience. 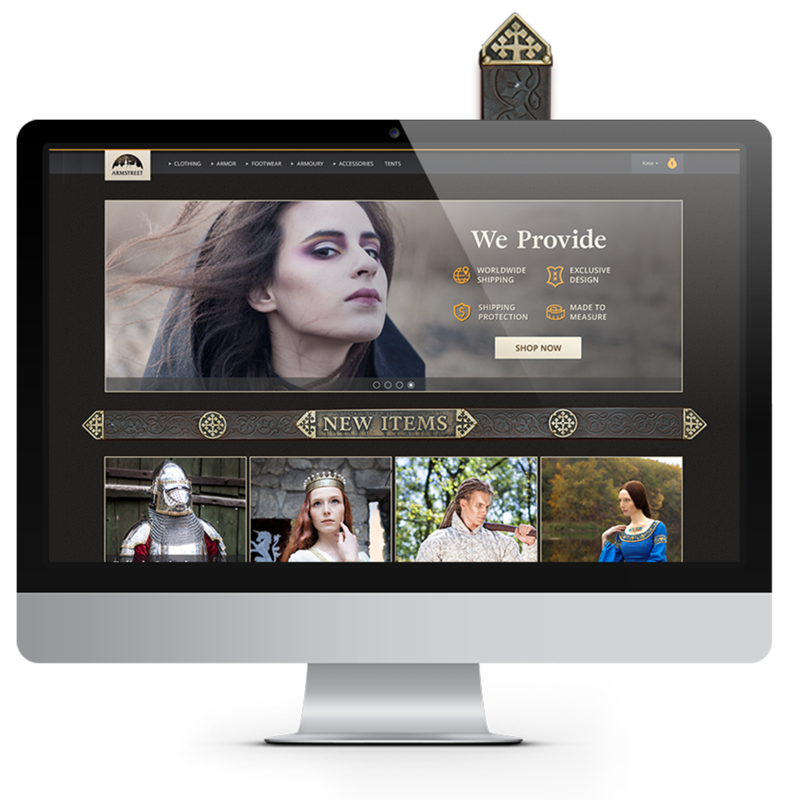 Armstreet wants not just to sell the product but also to engage Medieval and Fantasy lovers community. There are also articles, vlog and a lot of other content. The most complicated part in a custom production is to create the item that perfectly fits the client. Every client has the opportunity to choose the color and the material combination as well. So we need to get a lot of proper data from the client to manufacture the expected product. Armstreet creates many types of clothing and armor. There are dresses, women's and men's costumes, underwear, footwear accessories, gambesons, helmets, armor kits, etc. Some items are created with one type of fabric (Dress Tunic "Red Elise") and some with four materials (Costume "The Alchemist's Daughter"). Every material has its own color or texture variation. Customers can choose the color and the material variation they love and to order their own unique item. The goal of Armstreet is to make clients happy. Here the client meets the expectations. Clients want to be princesses or knifes or fantasy witches. This is possible just in the costume that fits good. So costumes and armors can fit perfectly just with proper measures. The UX challenge was to receive the correct numbers from the customers. Every person is beautiful and special. The clients have to understand how to measure themselves and to put numbers to the right fields (some armor sets have 17 bullets). This is exhausting and nasty process. The idea was to give the opportunity to do this job just one time. The customer can create sets for himself, family and friends. Fifteen years ago it started from the one tunic, but now this is almost thousand of different things. "Fantasy and Medieval" topic involves the variations of styles and periods. Our team creates not just clothing, but the whole world. And the customers feel engaged. of near to 20 items. The Alchemist's Daughter Collection comprises dress, bodice, boots, bag and accessories. And the King of the East Collection adds in twenty armor pieces. There is also Blog of Armstreet.